Sometimes others’ stories seem incomprehensible because they are so different from our own. Yet, a universal theme most can connect with, regardless of background, is hope. While Damascene Uwitije’s life and legacy are far from a fairytale, his story is a testimony to the resilience of the human spirit and the power of perseverance, as well as a remarkable reminder of the unsuspecting stories people carry. Damascene was born in the Democratic Republic of Congo; however, during the bloody civil war that cleaved through the country in the 90s, at only nine years old, he and his family were forced to leave their home. He, his parents, and seven siblings trekked for a month, witnessing the horrific spoils of war, until they reached a refugee camp in Rwanda that would then be home for the next 16 years. In class at Howard College in San Angelo, he seems like a normal student, albeit more attentive than most. 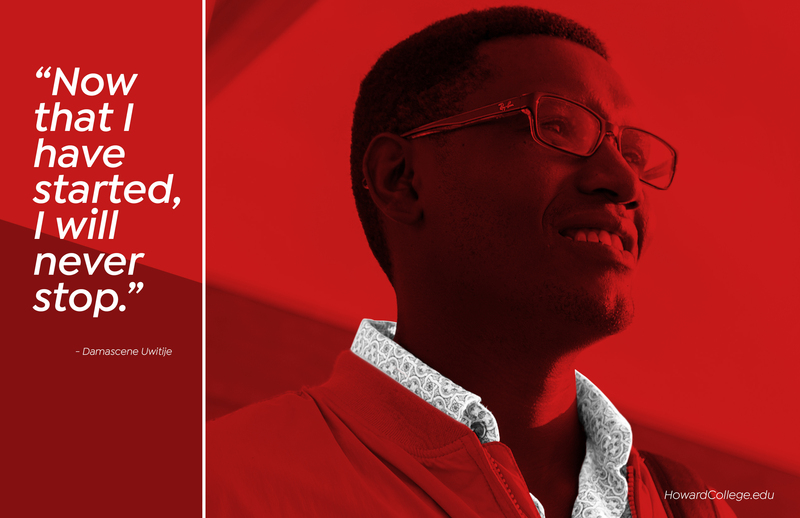 Reserved but focused, Damascene is engrossed in learning and connected with his instructors, while taking full advantage of the opportunity that is higher education in America. However, this classroom experience is much different from how his education began. In 2011, Damascene, and his family shortly thereafter, relocated to the United States. He describes his move to the US as a “completion of the greatest bridge of my life from hell to heaven.” He admits the cultural adjustment was challenging, but he could not help but think about other refugees who, for example, knew no English at all when they arrived in the US. He has given of his time and resources to ensure others can successfully transition to life in America as well. Humble and driven, Damascene works nights as a sand truck driver while going to school during the day, taking what would amount to naps in between. He has dreams of working in the Health Professions field, which he adds, “Now that I have started, I will never stop.” Although, his greatest goal once he finishes school and accomplishing his goal is to have more time to spend with his two young children and wife who live in San Antonio currently. In 2018, Damascene and his wife were naturalized and are proud to be United States citizens, ending 22 years of being stateless. Damascene is continuing a legacy built by his parents, fraught with determination and a will to make a better life for those ahead. Just a thread of his story is laden with reminders of how far drive, grit, and determination can lead a person. His story echoes our nation’s ethos of equal opportunity to see personal success made real.